Over the past few years, we have observed a slow but steady decline in shoppers’ numbers in shopping centres. In this competitive climate, shopping centres are employing several strategies to increase foot traffic. One prominent strategy is to have VIP events. We have collected and analysed data on many of the major VIP events from January 2016 until June 2017 at 140 Australian shopping centres. As expected, VIP events attract additional foot traffic in shopping centres. 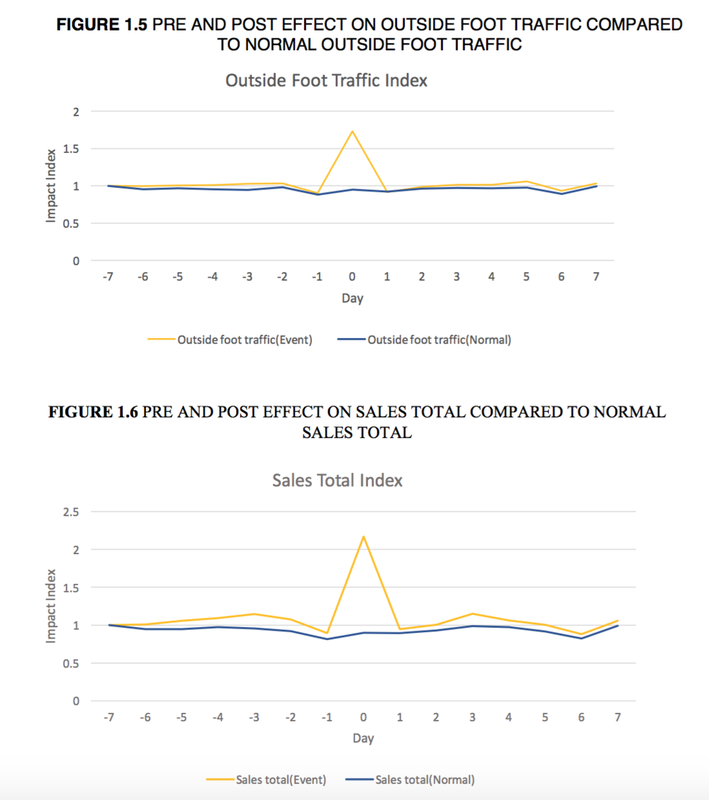 We found that the average event lifts foot traffic 1.5 times and sales 1.6 times when compared to a standard trading day (Figure 1.1 and 1.2). We observed that VIP the changes in foot traffic vary across the different locations in the same shopping centre. For example, at the most recent VIP event in Chadstone Shopping Centre, VIC, we tracked the outside traffic lift at 10 stores located throughout the centre. These stores experienced different levels of traffic lift of between 1.3 times to a high 5.2 times (Figure 1.3) and the difference is striking. The take out is that although the centre experienced a lift in traffic, this differed across the various locations in the centre – some retailers benefited greatly whilst others less so. As for differences in sales, we have classified retail stores into three categories of sales increase. The Outperformers can achieve up to five times more than their usual sales total (Figure 1.4). Stores that perform at this level during a VIP event can experience an incremental sales contribution of +2.2% of all annual sales. To further understand the effect of VIP events, we investigated the trends of shopping centre foot traffic and sales performance seven days before and seven days after the specific VIP event. Although there is clearly centre-by-centre variation, our data shows that there was an overall lift in foot traffic and sales in the seven days prior to and following the VIP event (Figure 1.5 – Traffic and 1.6 - Sales) when compared to a normal fortnight. Staging VIP events not only has a substantial impact on foot traffic and sales on the day, the benefits also extend to surrounding days as well. We estimated that a centre’s VIP events can make a contribution of an additional 0.4% in annual foot traffic. • The average shopfront conversion rate increases steadily during the day and hits the peak just before closing indicating late traffic want to buy (Figure 1.7). • Outperformers maintain high shopfront conversion throughout the day and therefore experience a disproportionately larger share of foot traffic into the store. • We see an opportunity for retailers to increase shopfront conversion before 3pm on a VIP day when shoppers require relatively greater ‘incentives/promotions’ to visit stores than later in the day. • It was seen that, on average, shopping centres are uniformly busy throughout a VIP event day (Figure 1.8a). • Average sales conversion rates peak during lunch time and extended trading hours (Figure 1.8b). • The extended trading hours (6pm-10pm) account for 24% of overall foot traffic of the VIP day. • Outperformers tend to increase roster levels throughout the entire VIP event day, rather than focusing only on later trading hours and these high levels of service deliver strong sales conversion across the entire day. • There is an opportunity for retailers to boost and maintain high sales conversion rates throughout the day by considering their roster across the whole day. • On the VIP event day, most retailers tend to provide discounts and the Average Transaction Value (ATV) drops by 10% as a result (Figure 1.9). • However, it is very insightful to note that Outperformers are able to achieve a lift of 35% in Average Transaction Values while offering large discounts. • Outperformers might offer more aggressive bundling and exclusive discounts that compel shoppers to purchase more items per sale (IPS) during the event. In conclusion, VIP Events do increase shopping centre traffic without any major impact on traffic in the prior and post periods. Smart retailers use these events to increase their inside traffic and sales conversion rates. We believe that outperformers leverage on the increased foot traffic generated during VIP events using a combination of (1) shopfront investment, (2) efficient and increased rostering and (3) exclusive discount strategies to incentivise customers to purchase more than they otherwise would have. The analysis above is completed using aggregate data collected from our Kepler sensors in our national stores network. Kepler Analytics is Australia’s leading retail analytics company. We provide a low cost, easy to install, advanced store sensor technology to measure foot traffic and customer behaviour, real-time store performance management software and tailored training programs for every level of a retailer’s business. Disclaimer: The information in this newsletter is true and complete to the best of our knowledge. The analysis is completed using aggregate data on national stores networks. The author and publisher disclaim any liability in connection with the use of this information.